Vice President Mike Pence surveyed flood damage in Iowa and Nebraska yesterday and Pence used the word “crisis” to describe the situation. Pence later stopped to pray with a small group of flood victims at a shelter in Omaha. He thanked Midwesterners for their resolve and for helping their neighbors in need. Pence also flew over the flood zone. The governors of Iowa and Nebraska have asked President Trump to declare a national emergency in both states. 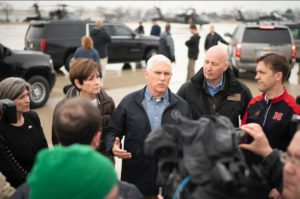 “At the president’s direction, we will expedite that request to make sure that the families and the communities that have been impacted have access to the federal resources and support that has been designed for exactly times like these,” Pence said. The governor of Nebraska told Pence his state was facing an “epic” disaster. 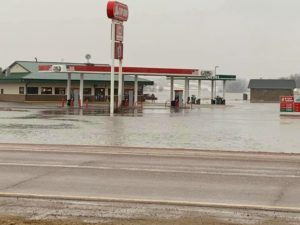 Iowa Governor Kim Reynolds used the word “catastrophic” to describe the flood damage in western Iowa. 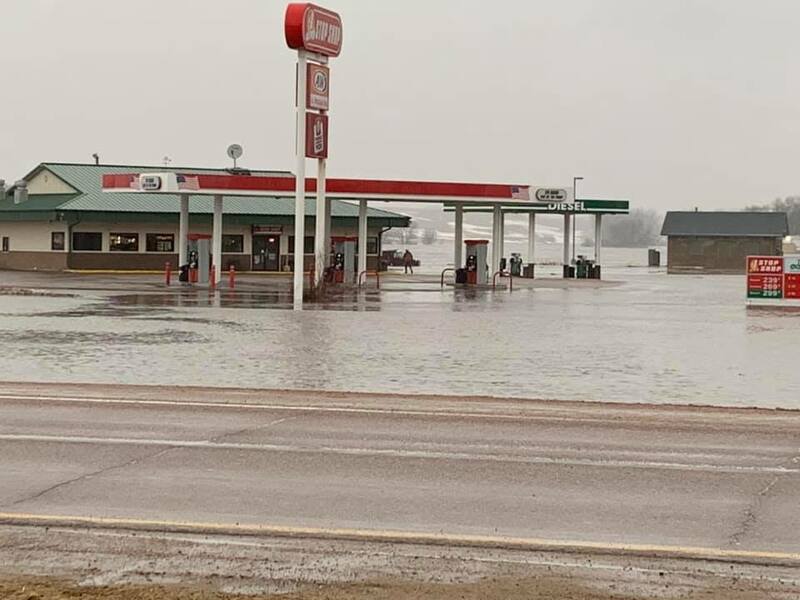 Every Missouri River levee from Council Bluffs to the Missouri border has been compromised by flooding and rebuilding that system will take billions. Tuesday morning, the water treatment plant in Glenwood was shut down after it was inundated by floodwaters. Officials say 300,000 gallons of water will be trucked each day to Glenwood from Shenandoah and Red Oak. In Hamburg, residents have to drink bottled water because Hamburg’s water treatment plant was compromised by flooding too.